This ‘young at heart’ exhibition features seven works by artists from Asia. “Imaginarium” is an excuse to celebrate immersive, interactive art with young children, or those young at heart. The works were carefully chosen to represent the diverse practices that are trendy in Singapore, and recast in a way that enables the audience to ‘walk into the art’. The latin originated suffix “-arium” denotes a location or receptacle. Imaginarium thus suggests a place, or confined space, where one’s imagination takes flight. Like Sensorium (2014), the artworks engage viewers’ multiple senses. In a campaign-like manner, Chiang Yu Xiang’s “We Built this Estate!” (2015) invites the viewer to participate in an imaginary urban planning exercise–positioning big building blocks to form towers, buildings and other structures, as if one was playing the role of a town planner. The other works are equally playful and literal. In Kumkum Dernando’s “Kiko’s Secrets” (2015) and Lee Jeeyoung’s “Dreamhouse” (2015) allow the audience to enter into a ‘space within a space’. The former, three imaginary worlds contained within three boxes big enough to walk into; the latter, a house that appears to be made of candy, which leads to a snowy white garden through the doorway. To some extent, the works are only as successful if the audience responds by giving themselves a chance to interact with the objects within the artwork. This is not a passive, deep-thinking type of exhibition. It must be experienced, even if it means asking the gallery sitter how things work if the instructions and rules are not absolutely clear or well sign-posted. At first glance, the nationalistic tag, in association with Singapore’s jubilee celebrations, appears superficial and overtly chirpy. The viewer would have to be familiar with the local subject matter, news and culture in order to interpret the works for their subtefuge undertones. These subject matter include: nature, greenery and affiliated ecological issues (Greenroom II and Trees), housing and land use constrained by Singapore’s small land mass (We Built this Estate! ), maker culture (Let’s Make! Studio), the workforce’s alleged lack of imagination and innovation (Dreamhouse and Kiko’s Secrets)and local folklore and pragmatic envisioning for the future (Imagin-a-doodle). I’m not being a cynic, but I think the elements of these works present an opportunity for the viewer to reflect more deeply about this nation-state. 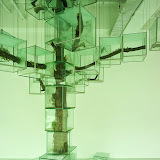 For instance, Takashi Kuribayashi’s mixed installation “Trees” (2015) reminds us of a terarium, and a dystopian segmented tree; a reminder of the nation’s status as a garden city, and the fragile balance between maintaining the balance between urbanisation for housing, industries and roads, with nature. Izziyana Suhaimi’s “Let’s Make! Studio” (2015), from a different angle, suggests the current lack of craft in our collective mindshare, and thus the need to re-introduce the importance of being able to make-create, to counter the consumption-only mentality. Vincent Twardzik Ching’s “Greenroom II” is a reminder of the nation’s promise to create more cycling paths, rising from the plague by congested roads and a growing demands on public transportation. Yet our obsession with gadgets (and the “air-conditioned Nation’s” inevitable consumption of electricity) might put carbon emissions into overdrive despite efforts to go green with new building standards, and promoting active means of transportaton, such as cycling. Nonetheless, the exhibition deserves an applause for taking the bold move to shift this signature programme to a new slot–from June holidays to March holidays. The Singapore Art Museum’s curators obviously saw an opportunity to experiment, and I think it has achieved some success by challenging artists to make immersive, interactive works for children.